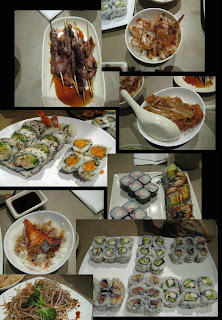 3) Portions - large in the sense that the maki rolls were HUGE, too huge to eat! C H R I S says do NOT devour this food! 4) Taste - not good, would not recommend the spicy tuna! 5) Price - average, but would not go back! 1) Appearance - Small little place off Erin Mills Parkway, kind of ugly furnishings, but it's fine. They've tried to create intimacy by creating private booths through the use of tapestries. 4) Taste - very very good! 3) Portions - quite large, but great for me! 4) Taste - surprisingly very good!